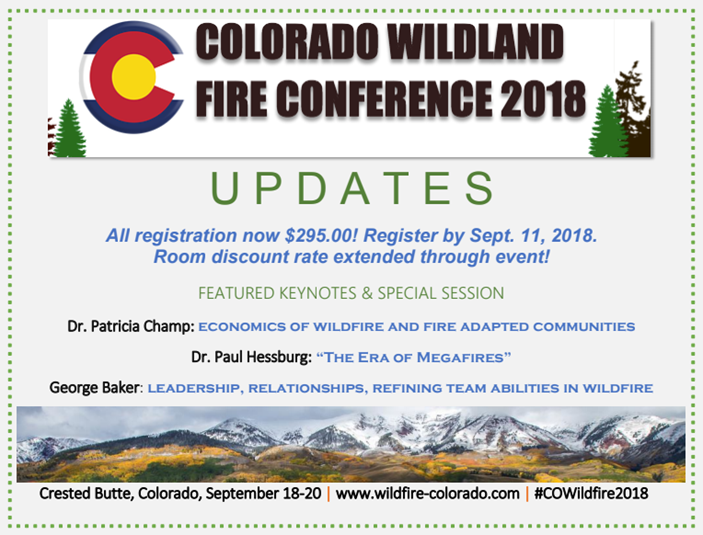 The Latest on Colorado Wildland Fire Conference: Continuing Ed Credits Now Available! Conference sessions begin at 8:00am on the 19th. Dinner and Live Music at Ten Peaks, Wednesday the 19th! Come enjoy great food and listen to local acoustic duo Jenny and Sam Pankrantz performing bluegrass, Americana, and folk tunes inspired by their life lived in the West Elk Mountains. This year's conference will provide an in-depth exploration of how human dimensions affect community adaptation to wildfire. SPEAKERS AND SCHEDULE can be found HERE. Learn more about current research using streaming imagery for realtime photogrammetry of the early periods of an incident. LODGING: Special rates for conference attendees at various area hotels, click HERE for more info. We recommend you CALL to reserve your room! LOOKING FOR MORE? See this video about places to go and things to do in Crested Butte! Get ready for fun and learning. See you soon!! Copyright © 2014 Southern Rockies Fire Science Network All rights reserved.